The worry of overspending at Christmas can be overwhelming. Christmas expenses mount up, and soon get out of control, putting huge amounts of strain on families during the run-up to the holiday season. If you haven’t already got a Christmas budget, now is the time to roll your sleeves up and start budgeting for Christmas! In 2016 the average American spent $935.58 on Christmas presents. £829 total for just one day! It’s crazy money, and as consumerism rises and the pressure for mums to keep up with the Jonses increases, we need a way to curb our excess and stop spending money on stuff we don’t need! Take a stroll down to your local budget store, have a look at all the pre-packaged gifts, the majority of it is overpriced tat ready to go straight to landfill. Don’t be tempted to fill your basket with overpriced junk just so your family will have loads of presents to open. Chat with your children and listen to what they’d really like for Christmas. Stick to buying only those things that they have asked for, rather than adding more junk just for the sake of it. Wouldn’t your child prefer the Fitbit they’ve been longing for rather than twenty poor quality presents they didn’t want or ask for? Go for quality over quantity when Christmas shopping on a budget, your kids will thank you for it later, and so will your credit card! Lets see if we can cut the average Christmas budget right down! That’s every single penny you will earn between now and Christmas. Take away coffee or drinks including bottled water. Now check the list to see if there are any items you can cross off your list to help with your Christmas budget. Lunch money could be crossed off if you decide to take a packed lunch to work or school. Take out coffee can be crossed off if you decide to make your own takeaway brew! Clothes can be crossed off the Christmas budget planner if you decide you can wait until the January sales for that new jumper! Haircuts are also something that could wait until after Christmas, as are nails and beauty if you’re really serious about Christmas on a budget! Cancel your gym classes on the run-up to the festive season and save some money for Christmas shopping on a budget. Work out how much money is left after all your outgoings are calculated. The amount of money left is the amount of money you can spend on this years budget Christmas. If you’re posting gifts to people you have not seen for many years, now may be the time to concentrate on how to do Christmas on a budget, and cull the gift giving! Chat with your friends and see if you can mutually agree to stop buying presents for each other’s kids, especially if you don’t see each other very often. Separate the list into kids and adults. If you are having a family gathering with many of the adults, agree to have a secret Santa to help you stick to a reasonable Christmas budget. You can now cross Great Aunty dolly from the south of France and Stacey from down the road and her seven children, off your gift list. 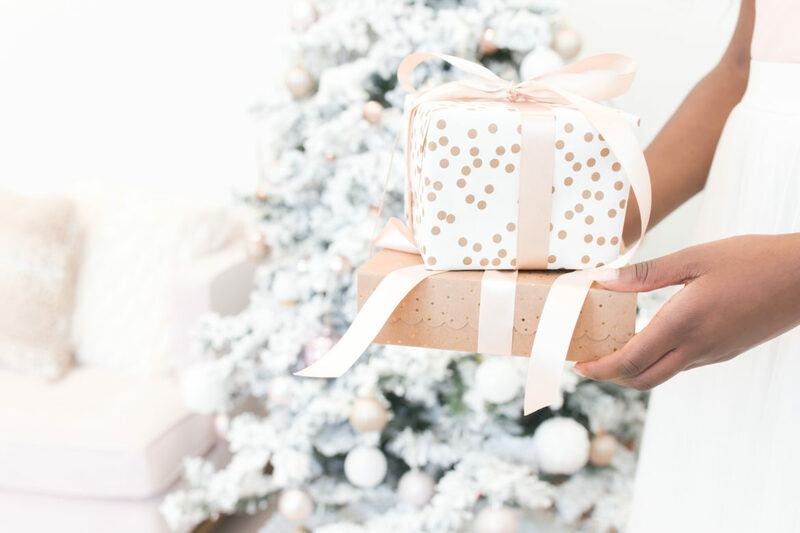 You’ll be surprised how much money you have been spending over the years on these unnecessary gifts, and it all mounts up to a pretty big saving! You’ll probably find that Stacey down the road with her 7 kids is relieved that she doesn’t have to find the money from her Christmas budget to buy presents for your three kids too! then see if you can cut down any further. Write a menu for Christmas day and work out how much money you will need for nibbles and trimmings. You can tighten your belt here, one of my best Christmas budgeting tips is to try to remember it is just a roast dinner with turkey instead of chicken! You don’t need to spend a huge amount on your food and drinks bill! If you need help with menu planning, read this post. If your budget doesn’t allow it don’t be tempted to book tickets on credit cards. Explain to your friends and family that the Christmas fund won’t stretch to travel this year, and that you don’t want to get into debt. Explain that you will be sure to visit after Christmas this year when you have more Christmas cash! Plan to spend Christmas at home if you need too! Decide on a budget for each person by splitting your list into people who are receiving a token gift and people who you would like to treat. Think about giving a homemade gift to the people who are just receiving token gifts. Good examples of a homemade gift would be, homemade cookies or fudge. Giving homemade gifts will leave you with more money to spend on those special people in your life. Create a Christmas budget per child from whatever money is remaining and stick rigidly to that list. Try buying within the four present rule: Something they want, Something they need, Something to wear, something to read. This is a great way to stop yourself overspending on stocking fillers just for the sake of it. Having a Christmas budget helps you to think about what you are spending and stops you picking up those impulse purchases when you’re in the bargain shops. My Christmas budget reminded me that I didn’t need the Elf on the shelf webcam from Home Bargains for £7.99 yesterday, it’s just another bit of stuff that will end up in the landfill in a few years time! Letting go of the guilt is a major part of Christmas budgeting, your kids have got enough, they are happy, just as we were as kids, ditch the mom guilt and tighten your belt! Stick to the Christmas budget and stay debt free this Christmas! If you really want to cut down on your spending this year have a chat with your spouse about exchanging gifts. Gone are the days that you need to spend heaps of money on each other to prove how much you love each other. You know you love each other without the gifts, agree to buy something you both need for the house or agree to go out for a meal after Christmas together, free up the cash by agreeing to quit the expensive gift buying for each other, focus your time and money on the other members of your family and stick to the Christmas budget! What is your Christmas budget? I come from a very frugal family where we only exchange one gift each, so it is easy not to overspend when I visit my parents. However, my spouse likes Christmas excess on every level, so there has to be a balance. We do a secret Santa for all the adults and the budget for that is £50 per present, so we are literally only buying one present instead of eight. Adults have the choice of a surprise or they can ask for something they need. Last year I asked for a soup maker and this year I’d like a tripod. The secret Santa has really helped to reduce our Christmas spending! Why can’t I use my credit card to pay for Christmas? From my experience, very few people have a Christmas budget and often pay for Christmas expenses by using credit cards. Using credit or borrowing money to pay for Christmas is not a great way to start the New Year, paying off a huge bill for one day of Christmas fun. Putting Christmas expenses on a credit card will also cost you a lot more in the long run if you end up having to pay the interest on the loan. The average APR on a credit card is approximately 18%. So, if your Christmas cost you £1500 you will be paying £270 in credit card fees unless you can afford to pay the bill straight away! What should my Christmas budget be? It is very difficult to put a price on your Christmas budget, but by following the steps above you should be able to calculate how much money you have to spend and should be able to shop accordingly. How will my kids cope with fewer toys this Christmas? How was your Christmas as a child, how excited were you for Christmas morning seeing the presents under the tree? When I was a child there was an average of about 10 presents under the tree between 4 of us, we were lucky to get more that one present and that was what it was like for most people before the crazy consumerism started to give us guilt trips and anxiety. It was before the Christmas adverts and mass Christmas panic. Black Friday was non-existent! We were still happy, well rounded, non-entitled kids. If we got a new bike for Christmas it was the most exciting amazing thing in the world. We didn’t need thousands of gifts, Christmas was special because we were all together as a family having fun. We need to remember that we are doing our kids a favour by not going into debt over Christmas and by spending responsibly we are teaching our kids that Christmas is about giving as well as receiving. Can you give me tips on how to save for Christmas gifts? If you do want to splash out on Christmas without getting into Christmas debt, start saving from January, ready for next year. Put some money to one side each week or month, set up a direct debit to go straight into a savings account and watch your Christmas savings grow! Remember to use a Christmas budget next year to help you stay out of debt! What if I have barely any money left over after my outgoings. This is common for a lot of people and it can be a real temptation to put Christmas on credit especially if you have children. If you possibly can, try to boost your income with a part-time job, many supermarkets have part-time jobs going at this time of the year, if you can get childcare. If you have very small children do not stress about buying lots of expensive presents as they are too young to remember Christmas or to understand gift giving. You should explain to other members of the family that you have not given gifts this year as your priority is to stay out of debt. With older children focus on trying to afford one present they have asked for, or promise to buy it for them in the January sales when you have more money. Try to focus on being together as a family and spending quality time together. If you’re struggling to get organised this Christmas follow our free Christmas cleaning and organising planner here, just jump in where you can and get ahead of your Christmas planning! Subscribe to our updates and receive the exclusive code to our FREE resources library packed full of free printables to keep you organized!